Hi, this made for a great couple classes. I used it with a B1 class and a B2.1 class yesterday. I simplified the tasks for the B1 group, and made them some true / false questions to make it easier. The B2 group, pre-first cert did it all quite easily and got a lot of vocabulary out of it. I recommend showing the second video at the end of the class because it is quite spectacular! The accent is American too and they can compare. 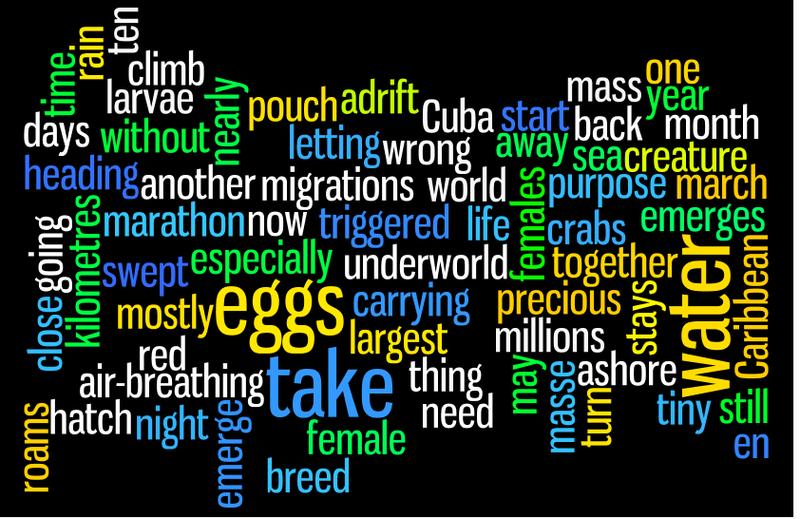 There is also a contradiction in the second story – do only the female crabs go to the sea, or the males too? So I asked them to listen for it, and the B2 class picked it up quite easily. I also rewrote the gap fill sentences for the lower class, which took about 5 minutes. There are only four people each class so that makes it a lot easier. All in all this was a really refreshing adaptable resource. Thanks a lot for sharing it. I’m glad this lesson worked well with your students, Linda. It’s great to hear how you adapted it for lower levels. Next time I have a B1 class, I’m going to do the same! Thanks for letting us know how it went.